Brunei Darassalam’s skies are set to get more crowded and its international airport busier, with an increasing number of airlines looking to serve routes to the Sultanate and the country’s own flag carrier positioning itself to maximise returns by sharpening its focus on the regional market. Brunei Darussalam’s construction sector is set to benefit from a number of new infrastructure projects coming off the drawing board in the next year, two of which will have particular significance for the Sultanate’s domestic economy and integration with its neighbours. On September 13, officials from the Sultanate and Malaysia signed a series of agreements that laid out the terms and conditions for the construction of a bridge spanning the Pandaruan River, which forms part of Brunei Darussalam’s border with Sarawak, Malaysia. Though the river is just 20 metres wide, those travelling between Temburong and the Limbang district of Sarawak must use a ferry service with limited capacity, which causes long delays during peak hours. EID UL Adha (Aidil Adha) is Hari Raya Haji to Bruneians. Moon sighting at various locations in Brunei would be held at the end of Zulkaedah to determine when the beginning of Zulhijjah would be and hence would also affect when Aidil Adha will be celebrated in Brunei. In the past the moon sighting for Zulhijjah was not practiced and Zulhijjah was determined using hisab or calculation. However the Aidil Adha celebrations in Brunei are not widespread compared to Eid ul Fitr or Hari Raya Aidil Fitri to mark the end of the Ramadhan fasting month. Aidil Adha celebrations in Brunei are rather muted compared to most other Muslim countries. It has been a while since I last showed Cuboiart's cartoon. Cuboiart is probably the single Bruneian I do know that can make this caricature come to life. The subtlety of his drawing is just unprecedented. 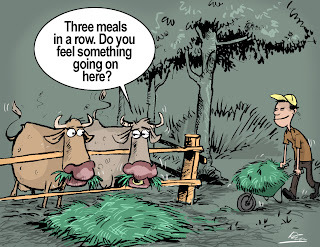 This one depicts the Hari Raya korban. The one he did for Thursday's is even hilarious. Catch cuboiart on www.cuboiart.blogspot.com. This was sold by a village in Tutong. 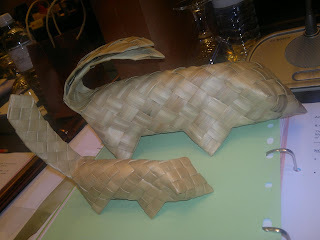 For those wondering what this is, this is ketupat made in the shape of a squirrel or tupai in standard Malay or basing in Brunei Malay. There are a number of sellers selling their village's products currently at Level 4 at the Empire Hotel outside the Indera Kayangan Ballroom. They were invited to do that as a showcase to how they can help transform their lives. The ASEAN Meeting currently taking place inside the ballroom is the ASEAN Ministerial Meeting on Rural Development and Poverty Eradication. Currently the Senior Officials are still meeting. The Ministers will meet tomorrow after the opening ceremony done by the Crown Prince.